I really doubt anyone is still reading this, but I thought I should post this anyway. This will be the last post on the blog. The official site is up, as such, this blog is unnecessary. Please do not check back here, as nothing will change. Lai Guys Comics is fully functional. We're all on Twitter too, so if you want to know what we're up to, please follow us. Are user names are in the sidebar. There is also the Lai Guys Comics Feed on twitter. Posted by Jen at 1:59 p.m.
Official Site Coming Soon! Seriously! I don't know if anyone reads this blog especially since I haven't been updating it regularly but I have some news. I'll start with website news. The site design is finished so I will be launching the website ASAP. I don't have an actual launch date for you but it should be up within the next few weeks if all goes well. Here is a preview of what the site will look like. And here is a preview of the Lemon Inc. site. Now on to Lemon Inc. news. I have formed a clear idea of where I want to go with Lemon Inc. and have familiarized myself with the characters to an extent that I know that I'll be comfortable writing for them. I have also experimented with several ways of drawing and inking the comic and have settled on a process. I haven't built up much of a buffer - okay I'll be honest I've already shown you all the comics that have been finished on the Lemon Inc. blog- but I intend to try to speed up my process. I have a lot of ideas I just need to get them down on paper. And finally Spiria news. I realise that you have heard little to nothing about Spiria. 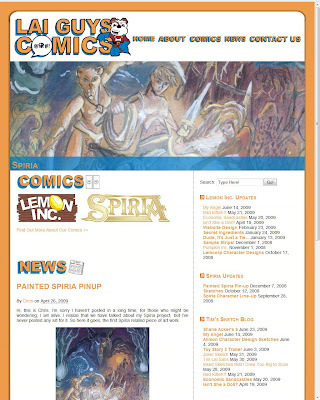 Chris has decided not to post Spiria online as a webcomic at this time. I won't elaborate much about it but he is still currently developing the project which he has always envisioned as a full length graphic novel. I would like to take this opportunity to remind you that the purpose of the website will be to both host our webcomics and to promote any web or print projects that me or my brother happen to be working on and as such you will be able to follow Spiria on our website regardless of what form it takes. Posted by Tim Lai at 12:56 a.m. Happy 2009 everybody. I hope that We'll be able to get our official site up this year. I'm currently trying to prepare for my comic and buff up on my knowledge of HTML and CSS. I want to thank everyone who visits our blog or follows us on Twitter and wish you all the best in the coming year. Posted by Tim Lai at 11:26 a.m. The Official Holiday 2008 Post! Have a merry Christmas, happy Hanukkah, happy Kwanza, happy holidays, and happy New Year from Lai Guys Comics. There was supposed to be a cartoon Kung Fu Santa beside this but I left it to the last minute and that didn't happen. Maybe later. Posted by Tim Lai at 1:46 p.m.
Hi, this is Chris. I'm sorry I haven't posted in a long time, for those who might be wondering, I am alive. I realize that we have talked about my Spiria project, but I've never posted any art for it. So here it goes, the first Spiria related piece of art work. It shows the four main characters from Spiria in the center, with the gentle glowing moon on their right, and the harsh, noon-day sun on their left. The main villain of the story looms menacingly over them. An army spills out of the gates of a fortified city, and a delicate blossom blooms from the tangle of vines that frames the whole thing. An art teacher of mine gave me a lot of tips and pointers while I painted this, so a big thanks goes out to him. Thanks! Hope everyone is enjoying these posts! If you see anything you like (or don't like), please leave a comment and let us know about it! Posted by Chris Lai at 9:39 p.m. If you've been to our blog before then you'll probably notice some changes in the design. I recently redesigned it to make it resemble the design of the official website that I'm developing for us. We also changed our domain name. We can now be found at www.laiguyscomics.com. However laiguyscomics.blogspot.com will still redirect you here. We're also trying out a new commenting system called Intense Debate. To comment on a blog post just click on the title of the post. To comment you have to either have an Intense Debate account or an open ID (Bogger, Wordpress, Google, or Yahoo! accounts can be used as open IDs). I also redesigned the Lemon Inc. Blog. Go check it out. I hope you like the changes and I would apprieciate any feedback you may have. Thanks for reading; I hope you'll return. Posted by Tim Lai at 12:06 p.m. I recently posted some sample strips for Lemon Inc. on the Lemon Inc. blog and I thought I'd post them here too. Right now the Lemon Inc. blog is our most active blog so remember to check up on it. Posted by Tim Lai at 1:26 a.m.
A Lai Guys Comics Halloween! The Lai Guys Comics Blog has been set up by Tim Lai, Chris Lai and Jen Lai to serve as a news section for our website which is still currently under development. The purpose of this website will be to serve as a means for us to post and share webcomics in a variety of genres for a wide range of age groups. 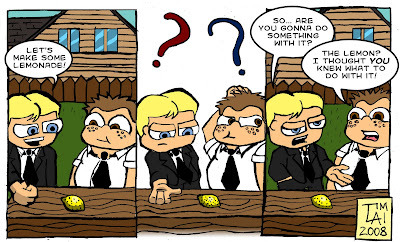 Until our official website is ready we will use this blog to post previews of our webcomics. Note: All art and words are © copyright 2008 - 2009 Lai Guys Comics and should not be used without our written or verbal consent.